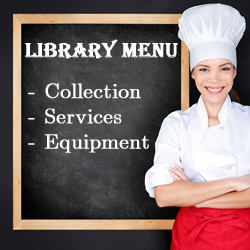 What’s on the Library Menu? Our collection of nearly 20,000 books is arranged by Library of Congress Classification (LCC). Our constantly rotating collection has over 200 popular, recently published titles. Our permanent collection of fiction titles includes both literary classics and great works by contemporary authors. This is our collection of biographical texts. Our collection of books on CD is for those who would rather listen and learn. This robust collection of children’s literature is available for Early Childhood Education majors or anyone with children in their lives. We have a collection of videos that can be viewed in the library. We also have access to the ever-expanding Films on Demand service which allows students to access educational videos from anywhere through our website. Other online film collections include Counseling and Therapy in Video, Criminal Justice and Public Safety in Video, Medcom Nursing Video Training Programs Collection, Naxos Video Library, and the Annenberg Streaming Video Collection. Our collection of physical magazines and journals has 55 titles and archives going back several years. Current newspapers include the Journal Gazette, Wall Street Journal, and Indianapolis Star with archives that go back two months. We have a wide array of over 2,000 posters that can be checked out for use in presentations and decoration around campus. We have over 350 puppets available to check out for use in children’s programs and projects. Successful research often hinges on the ability to find the information and sources you need. -Ivy Tech Northeast Library hosts over 100 resources that contain helpful articles. -We are committed to helping you find that right database to fit your needs. -Our main page of article databases is the gateway to larger, frequently consulted databases such as EBSCO, GALE, LexisNexis, Proquest, and JSTOR. -We also have an A-Z list with links to and descriptions of all of our databases. The Northeast Ivy Tech Library has many different handouts and instruction sheets that will help you use the resources we have available. We have printed versions of each of these handouts, however, we realize that many people like to have a digital resource as well, and the web format allows us to go into much more detail when explaining our resources. NoodleTools is a piece of software accessible in a browser that allows students to generate and manage citations. -Lets you save and access your sources from anywhere. -Will ask for necessary information based on type of source and style of citation being used. -Allows you to export fully generated References or Works Cited page as a Word document. Course reserves are textbooks that have been made available for students to use on the library premises. This allows us to ensure that there is a copy available in library whenever a student of that course wants to stop by and study. We are constantly expanding our collection of available course reserves. If our library doesn’t have the material you need, submit a request form for us to file for an interlibrary loan. We find out who else has the material available and get it sent here to you, free of charge. 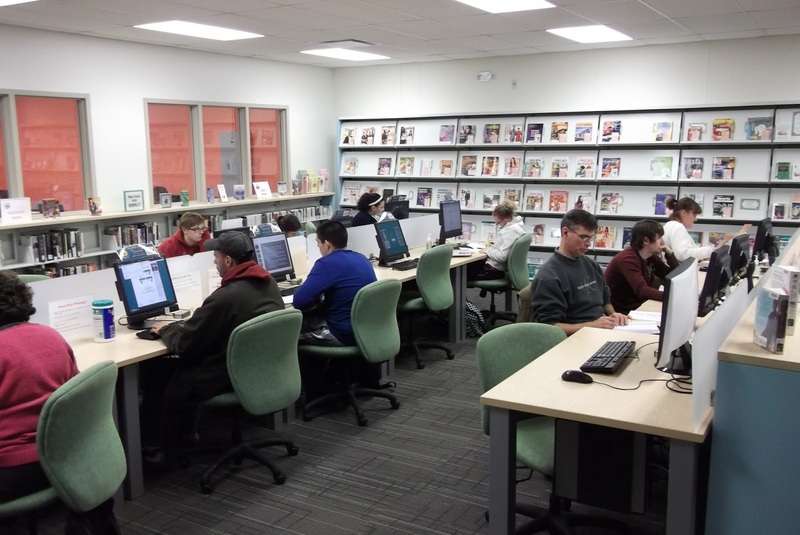 Students have the option of signing up for a 1-on-1 meeting with a librarian for in-depth help regarding citations, how to use databases, or anything else involving library resources. If two or more students are looking for help in the same area, there may be an option to organize a workshop. Instructors who want to schedule time for one of our librarians to instruct their class may do so. Instruction can take place either in the Library Presentation Room or in the Instructor’s classroom. We link to a variety of tutorials on how to use our resources, including videos that guide you through them. The library holds 20 study tables arranged around our collection for students who want a quiet place to work independently. This table features a stapler, paperclips, pencil sharpener, free pencils, a 3-hole punch, and a paper cutter. These rooms may be reserved by groups of students in order to study or work on projects. -One student may reserve two hours at a time, or a group can reserve four hours at a time. The library has 50 computers available for student use. There are four printers available for student use in the library, 3 black-and-white and one color printer. A copy machine is available for student use. It takes change or bills. Copies are $0.10 per side. -Make high quality copies in black and white, greyscale, or color. Laptops are available for loan to students who meet the requirements. We have several pairs of headphones available for in-library use. Available for check out. These come preloaded with IvyVILOS videos and over 100 audio books. Easy to use handheld video cameras are available for students to check out. Perfect for filming school projects. WiFi is available on the library premises for students to use with laptops and other devices. WiFi printing is also available with the download of a Pharos Software Suite.